The SMRC operates a state-of-the-art $100 million Regional Resource Recovery Centre (RRRC) in Canning Vale, which receives, recycles, and processes waste from some of its member local governments and the community. The Materials Recovery Facility (MRF) uses state-of-the-art systems and equipment to recover recyclables from the yellow-topped bin. All plastics, glass, paper, cardboard, aluminium and steel products are separated and baled at the MRF. 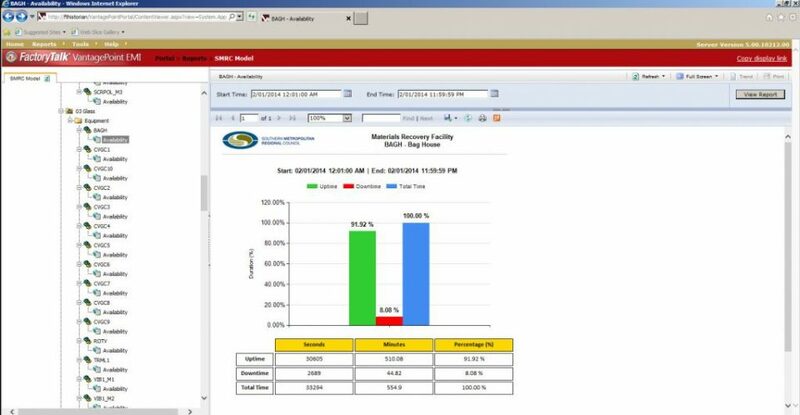 KAPP Engineering worked with SMRC to design, develop and commission a Management Information / Manufacturing Intelligence System (MIS) that would provide management the ability to view all equipment downtime in real-time via a web interface. While the existing SCADA system on site showed overall plant downtime, it was not possible to drill down and provide downtime for individual equipment so that the root cause of the downtime could be investigated. In a plant where there are 126 individual pieces of equipment running in a sequence it was a very time consuming task to manually evaluate and capture equipment downtime. The ability to determine equipment downtime is an integral part to achieving an overall target OEE (Overall Equipment Effectiveness). The proposed solution needed to be cost effective in comparison to existing high cost alternatives while achieving the desired functionality. The software solution provided utilises a single 500 point Rockwell FactoryTalk Historian product with intergrated FactoryTalk VantagePoint EMI as the front end. This kept the implementation cost very attractive and thus resulted in a feasible project. The Rockwell Historian product is built on a solid OSISoft PI historian back end and thus incorporates a myriad of advanced high performance yet low data volume features. KAPP Engineering developed some basic PLC AOI (Add On Instructions) which were easily mapped online on the PLC program that fed information to the historian. The data collected via historian was then queried and presented via a VantagePoint EMI Plant Model utilising a simple web interface. Screen captures of the web interface are provided in the photo gallery located at the bottom of this project write-up and displays screen captures of the reports that are generated. Once a report is displayed on the web interface it is possible to export the report out into Excel, Word, PDF etc. using the export tool within the report window. Furthermore, it is also possible to enter custom start and end times and refresh the report. This provides the plant manager a comprehensive tool for analysing the root cause of downtime within the plant. Below is a list of reports that were built utilising SSRS (SQL Server Reporting Services) with a detailed explanation on what information is presented. This report provides a view of all equipment that was not operational in the last shift. The tabular columns provide the name and description of the equipment along with the total accrued downtime in minutes. The number of times the equipment stopped is also displayed. A sample report can be accessed by clicking here. 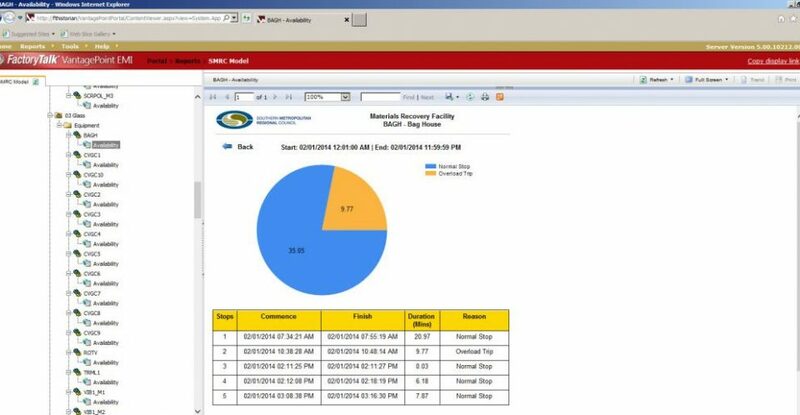 When the Overall Equipment Downtime Summary Report is viewed, all equipment listed with underlined text can then be further analysed via this report. Clicking on the underlined text takes the user to this report which shows the reasons why the downtime occurred and how many stops were captured. This provides the plant manager further detail on a much more in-depth look for root cause analysis. A sample report can be accessed by clicking here. 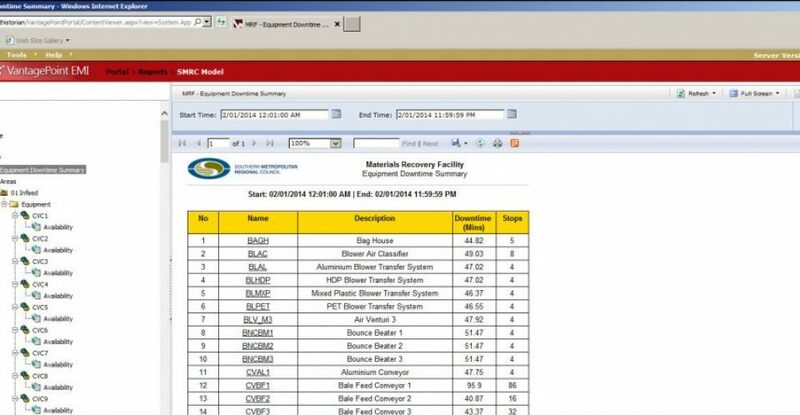 This report can be accessed from the plant model tree on the left of the screen by clicking on the individual equipment ID. This report provides a detailed look at up and down time in seconds and minutes for the equipment queried. A sample report can be accessed by clicking here. Clicking on the downtime graph shown in the Individual Equipment Summary Report takes the user to this report. This report displays all individual instances of downtime with reason codes displayed on a pie chart. A sample report can be accessed by clicking here. An uptime report is also made available by clicking on the uptime graph shown in the Individual Equipment Summary Report. 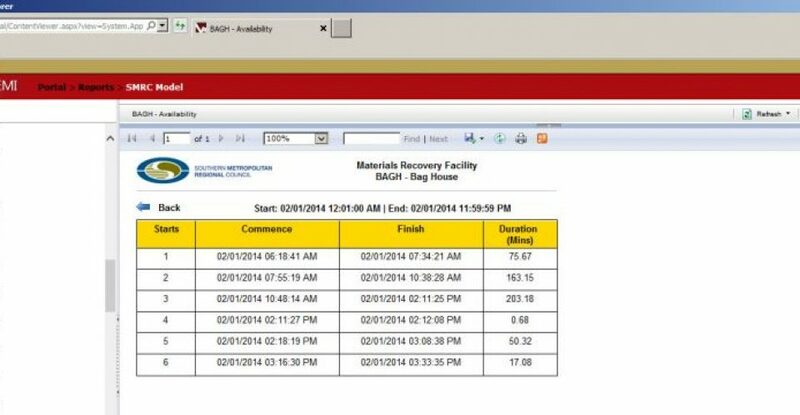 This report displays all of the individual instances of uptime for the equipment queried. A sample report can be accessed by clicking here. KAPP Engineering is also working with SMRC to further automate some of the repetitive manual paper tasks on the MIS.